CHH Pro Complete is based on the great CHH Vol. 1-4 libraries, those being almost completely reworked, so it’s like introducing a new product. The library is now based on Kontakt Player 5 and offers a completely reworked user interface as well as phase synchronized samples for perfect blending between velocities. 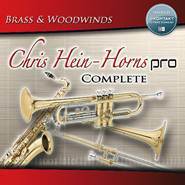 CHH Pro Complete is the most complete virtual-instrument library of Brass & Woodwind instruments for Jazz, Pop, Big-Band, Funk production but also to spice up your cinematic and orchestral tracks. With CHH Complete you get 54 Solo- and 32 Section-Instruments, partitioned in four volumes which contain different groups of instruments perfectly matching each other.